I want to show you my rack which I am building now in able to (start and) enhance my live setup. me in the direction I want to go. My setup exists of 3 main components. An elektron Digitakt, Moog Sirin (when I get my hands on one) and my modular synth. My plan at first was to use my elektron Digitakt + Doepfer dark time as the main drive for the setup. But after al lot of reading here, watching even more video's on YouTube my perspective for my live setup changed. 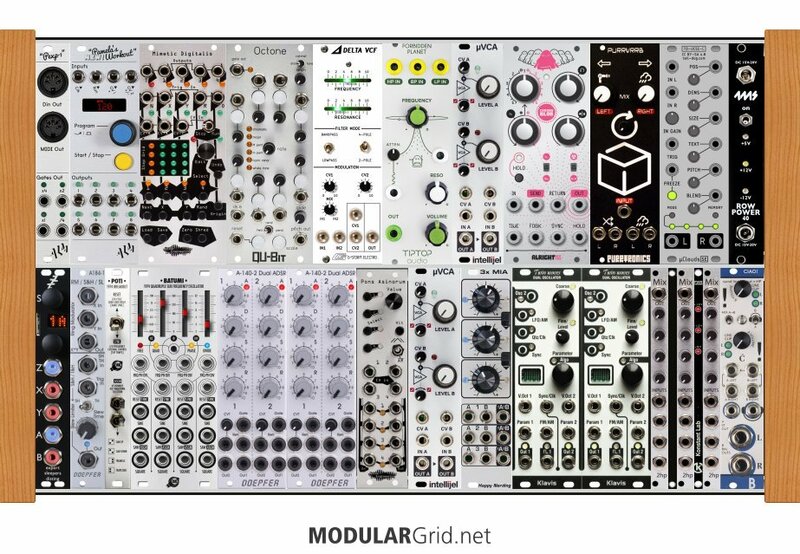 To drive all the modules and gear from my modular gives me more flexibility (read fun!). So my modular will be the main drive and to be even more specific the Pamela's Workout. This module will act as master clock, drive the Digitakt trough the midi out port (which I use for drum grooves and sample playback) and the other sequencers in the system. Off course I will experiment with the Pamela's outputs with my modular and external gear later. The Mimetic will mostly act as the drive for my modular to create some wicked synth patterns and the Octone will drive the Sirin for some cool baseline melodies although I'm still doubting about using the octone (any tips welcome!). At this point I'm not 100% sure what to expect from my modular. But I'm convinced this will be a nice addition to this setup. That I will discover by just using it. By posting my rack a hope we can discuss a bit about the experiences you guys have with this kind of workflow. What would you change, is there too much redundancy (I'm thinking about LFO's and sequencers). Also if you guys have questions for me shoot! I'll try to answer. To give you an idea what I like Patrick O Brian who gives the demo's from the noise engineering modules plays the sound I really dig. So I hope you enjoyed this thread. I start making my case from scratch every single part is made by hand by myself. The aluminium enclosure, wooden side panels as well the PCB bus boards. Is it customary here that cases are shown to eachother? The setup with the 2hp MIXes is brilliant, too...definitely helps the ergonomics to add those 1 hp blanks, but consider swapping one of those for a Konstant Lab PWR Checker to give you immediate feedback on your power rail loading and voltages. Doesn't get in the way, and it's always useful to have a power indicator for your rails in some place where you can see it in the event something should go bonkers with the power setup. Really nice to hear a compliment like this coming from you but it is because of your help I could start of anyway! my hands on the rest. Yeah the relation with the Pam and other devices over Midi is sick! I need to have it immediately! Like you said I love the fact I can quantize the Sirin through the Octone. which should be added to any case if there is space! I hope to show you guys some movies in the future! The Mimetic will give you CV voltages and even a gate out. But, it's not the easiest device to program in a live situation. If you save and store your patterns, then you'll be okay as you can load them on-the-fly. If you plan on setting up your patterns live, you might want something that has traditional analog faders or pots. I would also suggest at least one dedicated quantizer. The Disting can do it. But I would definitely NOT recommend the Disting in a live set-up unless you can set it up before your set begins. Also, Lugia once recommended to a Eurorack mixer with cue mix abilities. Perhaps he'd be kind enough to tell you about it as I don't remember the name... But you might be better off mixing on a traditional mixer that has pre-fader cues as you'll be mixing Eurorack with your line-level hardware synths... and finally, MUTES. DivKid just released a vactrol controlled set of four mutes built to avoid audible pops when switching them in or out. You can use the mutes on a traditional mixer for audio. But if you're trying to mute CV, then I'd definitely look into the DivKid mute module. Damn a quantizer, totally forgot about this! hmm the Disting offers me that but I will have a look around what other options I have. The other problem is space in my case... Thanks to mention the sequencer problem! For sure the plan is to use a external mixer as you mention. For now a have a pioneer Dj-mixer laying around but I'm planning to buy something more travel-friendly in the future. Anyone has thoughts on a mixer that will suit this setup? My dream has always been to use a rotary mixer but I think this does not work well in this kind of setup... or am I wrong. Anyway, thanks for your input keeps me evaluating my system and growth as synth/music lover! There's several mixers that have cue abilities: the Pittsburgh Lifeforms System Interface, the TEX MIX system from Tesseract, ADDAC's 807 system, and so on...basically, anything that has an AUX send will allow you to do a cue mix, but you might need an extra headphone amp module for use with those. Ladik's M-053 can also be used to split a cue mix out of a mono or stereo bussed signal with an additional headphone amp. hope you like it . Not to nit-pick you, but an aux send isn't always cue friendly. The aux send has to be tapped pre-fader/pre-mute to serve as a cue. On most Mackie boards, there's a switch that makes one or two aux sends pre-fader/pre-mute for example. If I remember correctly, you can also monitor the mute bus... anything that is muted can be selected for monitoring. It seems that the Klavis twin waves can output it signal pitch quantized which deals with biggest part of my problem. And as you pointed out I can use the Disting's quantizer in case I need it. The master sound radius 4V, maybe not the mixer you would come up first with but from my perspective not a bad choice. I need at least 3 channels (Digitakt, Modular and Sirin). It has a 3 band EQ on each channel which is very handy, each channel can be cued. It has an AUX send/return on all the 4 channels which can be pre/post fader. It is truly analog and rotary which I want to have since I started DJ-ing. Beautiful piece of gear! Sounds good! The movie is a bit dark so I cannot see clearly what is going on but since the sound is good that does not matter! keep on having fun! After reviewing my rack for the 10th thousand time. I think that maybe I have a little bit to much audio processing for my size of synth. Originally I want to use a Chronoblob delay, Purrvurb reverb and uclouds audio processor. I took away the uClouds and the 2hp mixers. Instead I used 2 Inetllijel mixup's. These audio mixers have mute switches and can be chained together underneath the control panel. In this configuration I can route the audio from my Moog in the modular synth if I want, mute it and,... Is sacrificing the uClouds a good choice for this alternative? I'm in doubt and can't figure it out. Hope I can find the answer here! It's worth noting that the Chronoblob 2 is 2hp wider than the original, so if you want to keep that rack configuration pick one up second hand while you still can! I don't think this case has too much audio processing, but too much modulation. Between the Disting, Pamela's and Twin Waves I think you're good in the LFO department lol. I removed the Batumi, mixers and the blank panels, and added in a new mixing suite, as well as some modules to compliment the Mimetic Digitalis. 2hp mix and mutes can take in all your mono patched synth voices and send them to the Disting or Chronoblob 2 to be converted from mono to stereo. Quattro Figaro can sum 2 stereo channels together (A&B,C&D) and be used for panning with it's normalled CV inversion. The pico modules (sequential switch and quantizer) when paired with a grid sequencer like the Mimetic Digitalis make generating new sequences a breeze. Not sure for the reason for the quantizer, though, unless you want to sequence VCF cutoffs. The Twin Waves (which aren't intended as LFOs here, but VCOs, giving four rather complex VCOs in just 16 hp) are internally quantized...sort of an unusual feature, but it definitely saves space + cost. The logical thing to replace it with, of course, would be the PICO MScale, as this would allow bidirectional CV conversion between this build and the Sirin, which fixes the Octone's inability to output negative CVs (which Moog stuff likes for some unholy reason). The Octone also internally quantizes, again sort of negating the need for a separate quantizer. Also, if you're removing the Batumi (bad idea, IMHO), the Poti would have to go as well, as it's the expander for the Batumi. Actually, I'd suggest keeping the 2 x Mixup version, or maybe consider substituting a pair of Happy Nerding PanMix Jr.s for the Mixups, which would then give you panning over each mixer input. Summing down those into the Ciao! would then make a lot of sense. Also, it would be possible to retain the Chronoblob2 (for stereo delays) if you lost the 1U blank and the PwrChecker on the top row, which would let you swap the earlier iteration of the Chronoblob out. Last thing to do is just a position swap, then: move the RowPower 40 from the right end to the left, to get the power supply away from the audio mixing/processing in case a noise issue tries to sneak in. You'd lose your channel mutes, but that's not too disastrous...just have to twist a knob instead of flip a switch, same result in the end. The dual Doepfers kind of kill a lot of HP. Malekko has some interesting options that combine sequencing with envelopes or CV modulation. 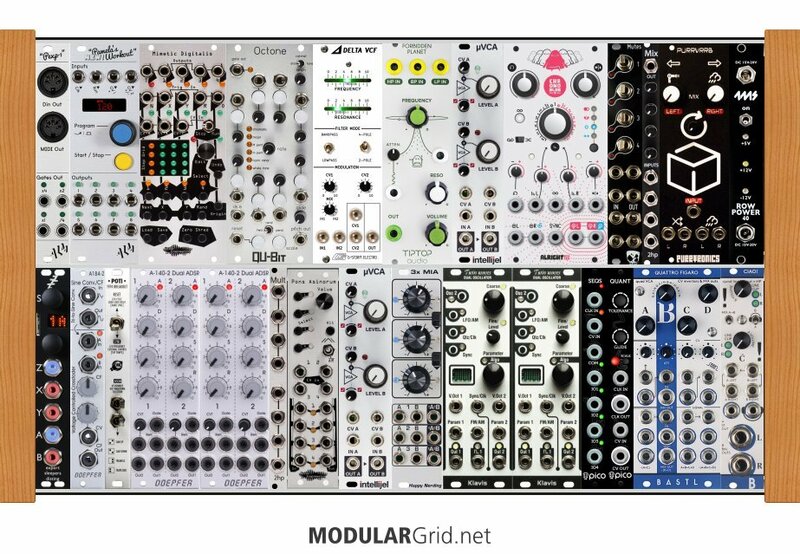 You can make room for them by switching to a 7U rack and using tiles for some of the functions (I/O, power, mixer). I added a steppy sequencer but you could also use two Quadratt tiles as sub mixers. Also, consider a dual FX in a more compact form, unless full parameter control is a critical component. Thanks for your thought on my rack but that is not really the "path I want to walk". The modular will be an addition to my current setup where I use an Elektron digitakt for drum rythms and other sounds which I can not generate with the synths and a moog minitaur for bass. The first thing that I notice is the Noise Engineering Basimilus which is a drum synth and not useful in my setup. As you mention I want full parameter control for my delay and verb and therefore I'll stick to the Chronoblob and Purrverb I prefer to have more control on a few specific effects than have a bunch and use them all because then it is going to sound "cheap". I see 6 modules that all can act as a sequencer which is to much for this relatively small synth. 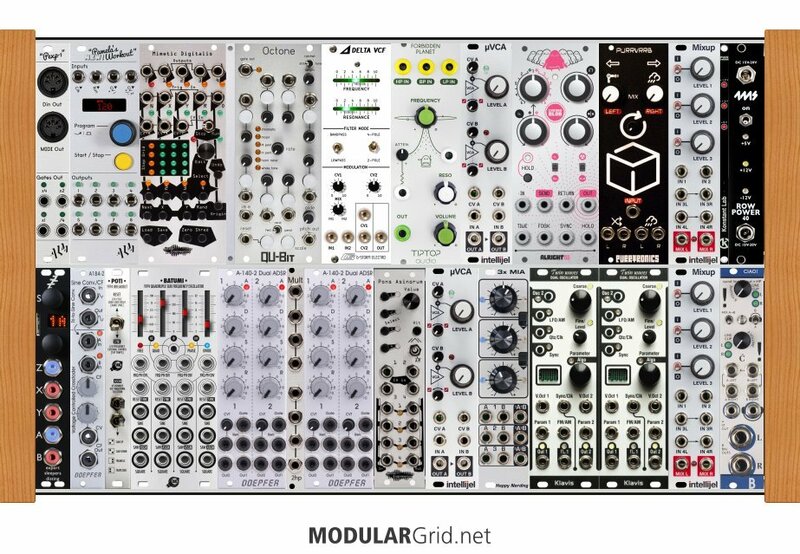 I already own the rack and 50% of the modules most of them are coming from the modulation section so so abrupt changes cannot be made any more. I can imagine this synth can perform but not in the way I want it. All though thank you very much for your thought and input! AAaaaaah! So much input! (love these emoticons!!) thank you so much guys! I need some time to process all the comments and figure out what suits my needs! Actually, I'd suggest keeping the 2 x Mixup version, or maybe consider substituting a pair of Happy Nerding PanMix Jr.s for the Mixups, which would then give you panning over each mixer input. Summing down those into the Ciao! would then make a lot of sense. It's worth noting that the Chronoblob 2 is 2hp wider than the original, so if you want to keep that rack configuration pick one up second hand while you still can! I considered purchasing the stereo version but I don't see the win of a stereo delay compared to the loss in hp and the extra investment. Quattro Figaro can sum 2 stereo channels together (A&B,C&D) and be used for panning with it's normalled CV inversion. Can you explain this more in detail please? The quattro figaro is 4 vcas with mixed outputs, if you use the AC & BD outputs as left and right respectively, you can put a mono signal in input A and have it normalled to B (mono to stereo) or the left and right outputs from the purrverb into VCA channels A and B (stereo to stereo). The top half of the module (above the black line) is the CV section, there are 4 CV inverters and attenuators, so you can create a stereo field by having the volume go up in one ear and down in the other. Check out this video at 42 seconds for more info, they demonstrate mono to stereo as well as panning.  Edit: I don't know why but modular grid is not showing the synth the way I saved it... If you click on it you can see the good version. First of all I moved the power supply away to avoid noise issues. To start from scap. The Pamela is the general clock that drives the whole system. It drives the Digitakt for drum rythm, the Octone that drives the Moog and the Memetic Digitalis which is the main drive for the modular part. Not keeping modulation in mind. The oscillators are patched to the Pico SEQS for some crazy sequences since the twin waves can output quantized signals I can keep everything in key. All my mono signals are patched to the mutes and then the signals go to the 2hp mix. The output from the 2 hp goes to the Happy Nerding Panmix Jr. Which if I understand if you put a mono signal on the input it outputs a stereo signal. The output from the Panmix is routed to the Bastl Ciao and I have a line level output. This is the general idea. the mono signal after the mutes can be routed trough the delay and then to the 2hp mix or to the Panmix. The signal can also be routed to the Purrvurb but then the output is stereo, to process this with I need a stereo mixer not? Or do I have an alternative way to do this in my setup? Thank you all for your input! Disting also has a very nice sounding mono to stereo reverb, and I'm pretty sure the Ciao can take 2 stereo signals or internally normal a mono channel to both left and right speakers. So channel A on the Ciao comes from the Purrverb and B could come from Disting reverb or directly from 2hp mix. The Chronoblob 2 has dual delay modes, which when clocked and fed audio from something percussive like the Digitakt create polyrhythmic delays bouncing from one ear to the other. 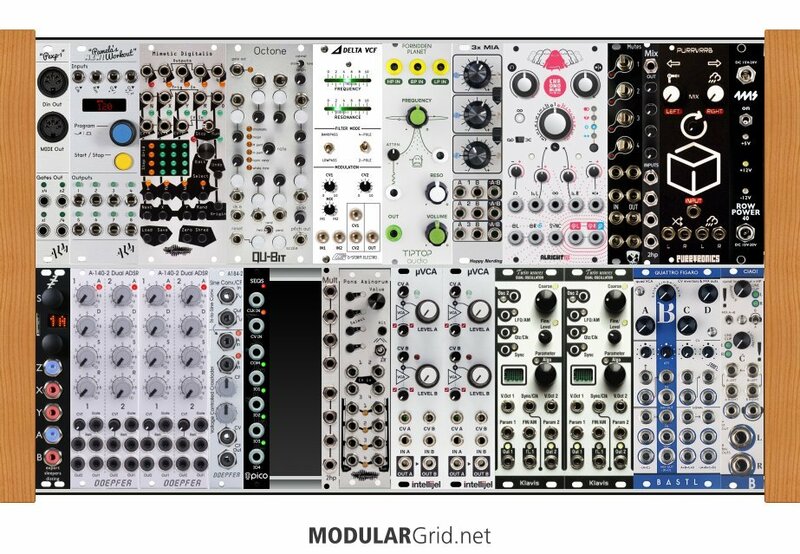 Also your rack doesn't really have a spare filter or something to put in the send/return loop of the chronoblob, whereas the new module can be run mono with a feedback loop OR stereo. Again the Disting has a clocked delay, but the chronoblob 1&2 have a lot more functionality. Also the latest image of the rack I posted didn't update either, I left a 6hp gap which you could fill with something like a Dixie 2+ from Intellijel which is an analog VCO/LFO with sync. I tried hit the picture from your rack but I get a large question mark as result. After reviewing all your comments I came up with my new (final?) design. Since the Disting is such a versatile module and is mentioned here several times for different applications I decided to add an extra module. It can fixes a lot of problems in my build. The Mutes also got a place in my build because I think it is a good aid in live performances. all my mono AND stereo signals and output the synth to line level. For all the guys following this thread and and helping my to build a synth that follows my philosophy can we consider this as a solid build? Thanks in advance for al the comments!